Kona coffee is known as one of the finest coffees in the world. This in-demand delicacy is cultivated in a small area on the slopes of Mount Hualalai and Mauna Loa in the northern and southern districts of Kona on the island of Hawaii. Like a fine wine, 100% Kona coffee is crafted with a lot of attention given to the hand-cultivation of the coffee plants, and extra care given to the curing and roasting of the beans. 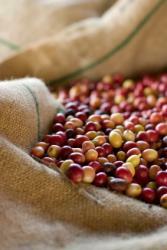 The resulting single-origin coffee is delicate, flavorful and has a rich aroma that is distinct only to this region. Kona was first introduced to Hawaii in 1828 by Samuel Ruggles who brought cuttings with him from Brazil. 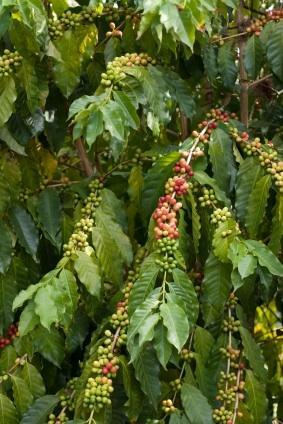 The thick, volcanic soil in this region and the unique weather and temperatures made ideal conditions for growing a highly flavorful coffee bean. Later in the 19th century Kona became a consistent and highly regarded cash crop, grown on large plantations. In 1899 there was a major crash in the world coffee market and the plantation owners had to lease their land to their workers, many of whom were originally from Japan. Each farmer received between 5 and 12 acres, and when properly farmed, these parcels yielded large crops of high quality coffee. Today, the tradition of smaller family farms continues and now there are approximately 600 independent farms, which produce about two million pounds of green coffee per year. The coffee blooms in February and March when tiny white flowers carpet the trees, known as Kona Snow. Green berries begin to appear on the trees in April and by late August the red fruit, or "cherry", begin to ripen for picking. In Kona, the trees are hand picked many times between August and January. Hand picking ensures that the cherry are only picked at their peak of maturity. Each tree provides around 20 to 30 pounds of cherry. As soon as the cherry are picked they are run through a pulper, where beans are separated from pulp, and then placed in a fermentation tank overnight. Fermentation time varies between 12 and 24 hours, depending on the temperature. This process is key to an excellent end product, giving the coffee its bright, clear flavor. Once properly fermented, the beans are then rinsed and spread out to dry on a hoshidana or drying rack. After the beans have reached an optimal moisture level of between 10 and 13 percent (this takes about a one to two weeks), they are milled by machine to remove the parchment and silverskin. The resulting green beans are sorted and graded and then either sold to roasters or custom roasted by the farmer to produce the end product. The beans are usually graded by size, and some farmers believe that the bigger the berry, the better the coffee, although others say that size does not affect taste. The most important thing a farmer or processor can do--beyond the growing and fermentation--is properly roasting the beans to bring out all of their nuanced flavors. When purchasing Kona beans it is imperative to buy only those that are labeled 100% Kona. If you purchase a Kona Blend, you are likely getting only about 10% Kona beans and 90% beans from South America. Also, be sure to purchase whole beans and grind right before brewing your coffee. The beans will last in an optimum state for several months whole, but only about one month ground. 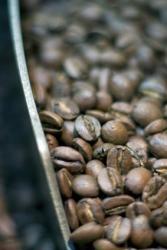 Here are a few online resources to purchase 100% certified Kona beans of the finest quality.